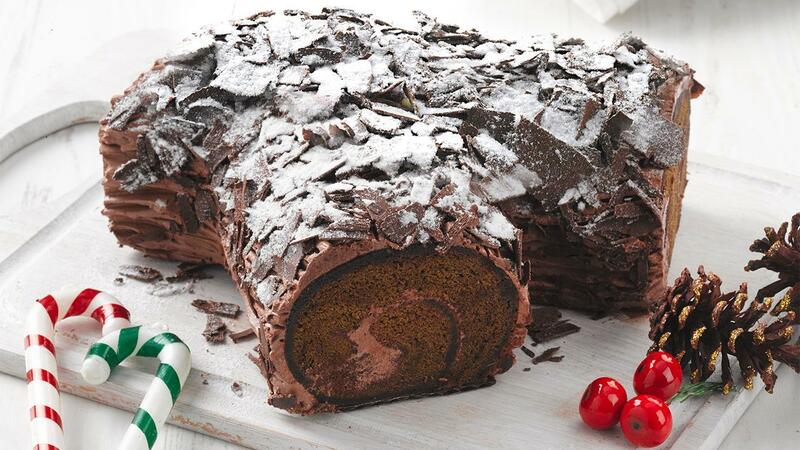 This tree-shaped chocolate cake is not only beautiful, but also tasty and tender. Child customers will love it. Mix and whisk egg yolk and egg white, icing sugar, wheat flour, corn starch, milk powder, and emulsion until white and very fluffy (whisk for a minimum of 7 minutes at high speed). Put margarine, Toffieco grilled rum flavouring, melted butter, chocolate powder, chocolate paste, mocha paste into the bowl and stir well. Put the dough into the pan in the oven and bake at 180°C for 30 minutes. After it is done, put it in an airtight cabinet for one hour. The cake then will be moist. Whisk original buttercream, melted chocolate, and peanut butter until well-mixed and creamy. Use the mixture to glaze the cake and roll, and spread the rest of the cream on the cake.